Earl Wild has been a legend for longer than most of us have been alive; here we have a brand new version of the massive and taxing third sonata, recorded in his 87th year, a selection of shorter pieces from two years earlier, and a 1982 live performance from Paris of the Paganini Variations. When we think of Wild, the picture in our mind�s eye is that of a keyboard wizard of the old school, one who combines a phenomenal technical control with a touch of dare-devil "I do it my way". After all, he has been something of a specialist in works and transcriptions by composer-pianists of the early 20th Century romantic school � remember his recording with Erich Leinsdorf of one of the Scharwenka concertos at a time when such music was sneered at. And he looks the perfect patrician virtuoso wizard. I remember him giving a concerto in Edinburgh in the early 1970s � don�t ask me which, it may even have been the Scharwenka � and more than any musical phrase I recall the visual image of his tall, erect figure (a very straight back) despatching hair-raising passages with, apparently, total nonchalance. He hardly seemed to be putting any effort into it at all! In this only Horowitz surpassed him. I also remember the extreme clarity of his sound which registered in the back rows almost as if he were only a few feet away. Though he has been recording since 1937 he has not been quite a household name on disc. He has not consistently been associated with one company, like Rubinstein-RCA or Arrau-Philips and some of his discs, such as the Rachmaninov concertos with Horenstein, came out almost by stealth (as a Readers� Digest album) and remained unknown for many years. We have also not had very many opportunities to hear him in extended works, like the present Brahms sonata, from the general repertoire. He now records for Ivory Classics and they deserve to make each others� fortune. 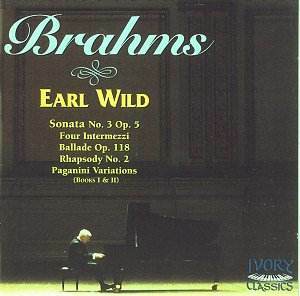 As befits a pianist in the old-school-virtuoso mould, "Earl Wild plays Brahms" is definitely "Earl Wild plays Brahms". If you listen to the recording of the sonata by the admirable Stephen Hough on Hyperion, you will quickly sit back and find you are listening to Brahms. At the end you will be grateful to Hough for playing Brahms so well, but the interpreter is not forever present. I don�t want to suggest that Wild twists the music this way or that according to his personal whims, in fact he doesn�t. But in the same way as Horowitz would frequently give performances with no detectable deviation from the score, yet which proclaim his own personality in every bar, so it is with Wild. Compare the way he begins with that of Hough; there is something in the sound, so bright and spot lit in every note, something in the phrasing, imperious and commanding our attention, something maybe in the timing of rests, of the transition from one idea to the next. And "Earl Wild plays Brahms" is an enthralling experience, undimmed by his advanced age. Listen to how the scherzo leaps into life, or how the textures of the finale are illuminated, or how the melodic strands in the Andante espressivo are separated out from the accompanying figures. The final climax of this latter movement put me in mind of a story about Heifetz, who was berating a student for producing too little tone at the climax of the Chausson Poème. "You will be lost under the orchestra". A friend present at the lesson intervened: "But, Jascha, the violin always is lost under the orchestra at that point". But Heifetz would have none of it. Unconvinced (with other violinists the violin was always drowned at that part of the music) the two could only wait till the next time Heifetz programmed the piece. And, sure enough, his powerful tone dominated the whole orchestra. In the same way, Wild has the upper line in the texture soaring over the rich textures in a way that most of us tend to think a piano just can�t do. That�s great pianism. The shorter pieces are equally spot-lit and up-front, purged of the autumnal melancholy traditionally associated with them. In at least a few cases I felt that Wild�s own bright optimism was at odds with Brahms�s natural melancholy (might not op.119/3 sound more teasing at a fractionally slower tempo, and does not op. 76/6 surge when it should reflect? ), but it is salutary to hear them this way once in a while. Only in op. 79/2 did I seriously feel that Wild was missing the sheer blackness of one of Brahms�s most tragic and angry utterances. The Paganini Variations are unique in Brahms�s work; unique in their exploitation of a sheer virtuosity worthy of the violinist who inspired them. Wild makes light of them in a marvellous display of light and shade as well as of infallible technique that rightly evokes cheers (and the French are inclined not to be lovers of Brahms). This 1982 recording also reminds us that the greatest pianists are harder to record than the merely good ones. The "ping" to their tone (I�ve heard Wild use this word in an interview), which is the means by which they reach the back of the hall, can sound aggressive, even bashy, under the close-up glare of the microphones. It does a little here, but don�t let that put you off. And in the recent recordings it has at last proved possible to capture a great pianist without discomfort. The sound has remarkable richness and presence. Comparison with the Hough, as admirably recorded as it is played, shows this up too. You won�t always want to hear Brahms played this way, but if you care about the composer, or about the piano, you�ve got to have this.